Ten years ago today, I was celebrating my first anniversary of ordination to the transitional diaconate. Playing lots of tennis, running lots and preparing for my first Women's Quest retreat. Learning how to grow herbs and spinach on my shady apartment balcony. Working on the restoration of a small family chapel in Pennsylvania. What are were five non-work things on my to-do list for today? Create mileage plan for the Boilermaker Race--just a month away! Weed raised beds at both Dorset Harvest Farm and Seeds of Grace gardens. Purchase a home in Asheville, NC for mom. Buy a house in Portland, Oregon decked out with my dream kitchen. I won't tag anyone but if you feel inspired consider yourself tagged! 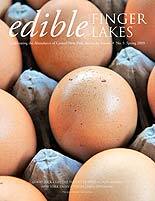 Coming soon: Guest Blogger Marty Butts on Syracuse's Empire Brewery. Archive Alert: On this date in 2007 I was cooking up a risotto dish on Food for Thought on WCNY TV. 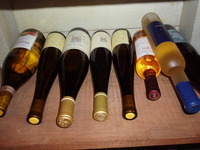 Inspired by the wonderful new Central NY wine blog, Finger Lakes Weekend Wino, I went to my "wine cellar" and took a long hard look at what was in there. I go down to the wine cellar every week to rotate the bottles but rarely really think about whether everything deserves to be down there. Following Weekend Wino's lead I plan to catalog everything so I can work with the font of knowledge that is Gary Decker (over at Vinomania, a Gem of Syracuse) to figure out what I should drink and what I should save. The photos above represent about two-thirds of what I've got. Many of these bottles have been purchased over the past couple of years and many of them were going away gifts (from Berkeley) and welcome gifts (to Syracuse). If you're like me, you find it hard to resist buying wine. I'm always buying wine and then remembering that I have lots to drink at home. 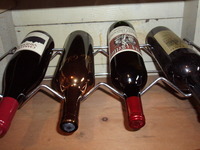 I don't drink wine every night and I'm the only consumer in the house so it takes a while. This is one of the reason's I can't wait for the holidays--many more occasions to drink the good stuff--Fermentation's recommendations notwithstanding. 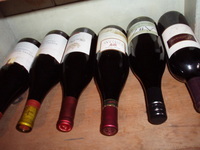 In the meantime, Beau has suggested that I begin a new wine meme/challenge deal where bloggers are asked to open a bottle of wine from their collection each month--say the third weekend of the month--and write about it. I know I could use more excuses for drinking what I've got--that way I can make room for what should really be cellared. Stay tuned for the official wine challenge coming soon! The same was true for making scones and biscuits--I always cut the butter with a pastry cutter. This was written on June 29th when I participated in my first meme--Utensibility! Sam wanted help spending money on cooking gadgets so I got a chance to wax on about my KitchenAid Food Processor. But this line was recalling a time back when I was 15 and a bit of a Luddite and preferred not to use any applicances like mixers, beaters, etc., when cooking. Now, I couldn't live with out my food processor to make scones and biscuits--it cuts dough in less than a minute. I probably had more time when I was 15...hmmm, miss those days. That 23rd post was written only a month and four days after I began this blog. Not that long ago, really. I'm still a newbie at this blog thing. But in just over four months of food blogging I've been amazed at the connections, reconnections, and new ventures that have come about. I've not only gained new friends across the blogosphere but have the privilege to watch one of my dreams come true--people getting excited about great food in Central New York. So thank you, dear readers, for hanging in there with me. What I Couldn't Do Without--Utensibility! 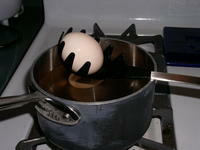 Ah, now I feel like a food blogger--I'm participating in a meme hosted by Sam of Becks and Posh called Utensibility. She gets to go shopping and I get to wax on about the cooking gadgets I think no kitchen should be without. When I was a young cook of nine years old I would diligently follow the recipes in my Grandfather's 1932 edition of the Fannie Farmer Cookbook. So, if the brownie recipe called for stirring the batter for 50 strokes by hand--that is exactly what I did. The same was true for making scones and biscuits--I always cut the butter with a pastry cutter. You might say I was a young Luddite--but I liked to think of myself as a purist. I think I feared that machines would disconnect me from being able to "feel" the food--cooking would devolve into a less intimate sensory experience. I eshewed the electric mixers, blenders, and other handy motorized gadgets. That is, until I was given the gift of a Kitchen Aid mixer. I love my mixer, but the piece of cooking equipment I think is really indepensable is my Kitchen Aid food processor. I soon discovered that I was able to get in touch with the sensory experience of food a lot quicker--and that I still had to rely on how the food felt and looked at each step of the way to guide my cooking. 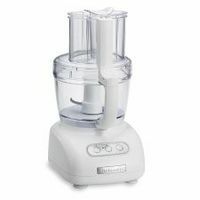 I loved this food processor from the very beginning because of the ease and speed with which I could slice onions and chop peppers and other vegetables. Chopping nuts, making bread crumbs, pestos, and purees--piece of cake. But baker that I am, my whole world changed when I discovered that I could use it for making scones, biscuits, and pastry dough. Out went the pastry cutter! Making pie crusts takes just minutes. I could make a whole savory tart with this food processor in no time. I've had this machine for six years and it has worked perfectly every time . I use it nearly every day. 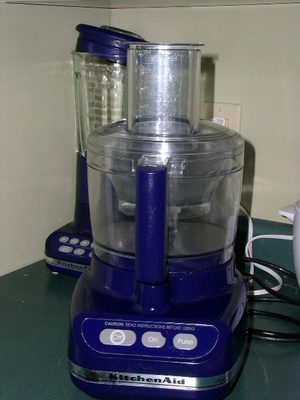 I was very happy to recieve this Kitchen Aid food processor as a gift because it is a bit of an investment. 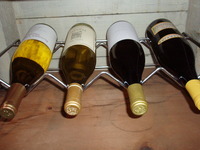 Finding one is easy--all the major department stores carry it as well as Williams Sonoma and Sur La Table. In fact, the Williams Sonoma website has the 12-Cup version on special for $229.95. And it is the newer design to boot. On the other side of the spectrum is small utensil that I find myself using more and more all the time. It is a pasta claw. I've discovered that pasta is just the beginning of its utility. Of course, it works great for stirring pasta and lifting fettucine out of the pot but it is also perfect for lifting eggs out of boiling water (both hard boiled and poached). And since I eat eggs a few times a week I find I'm always reaching for it. Finally, because of the large hole in the center, it works a lot like a super slotted spoon--whenever I want to lift larger pieces of meat or vegetables out of a sauce (quickly) this is the tool I reach for. 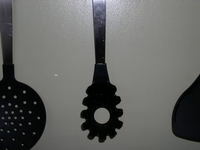 Pasta claws can be found in all the cooking departments and specialty stores for about $10.00. The Kitchen Aid food processor and the pasta claw are really aids in the kitchen. Unlike a bread machine (which I cannot find it in my heart to use) these gadgets still keep me in touch with the cooking process. They won't do all the work for me--just enough to keep things fun.